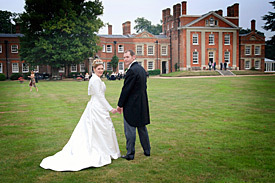 Where practical all packages include a pre-wedding meeting at your home or wedding venue. This will provide the opportunity for us to get to know each other and feel relaxed about the wedding proceedings. We also discuss your requirements and list the special photographs you want, as well as the key shots. This incredibly popular package, is exactly what it says! We come along, take the pictures and give them to you on a CD-Rom at high resolution so you can make your own arrangements for printing and albums. The pictures will be cropped and checked for colour balance and exposure but that's about it. You will have our permission to copy or print the pictures for yourself or friends use as you see fit. One complete set of either 8" x 6" professionally produced photographic prints. A CD-Rom containing high resolution copies of all images taken. A professionally produced album of 30 prints of your choice in a leather (or similar) album in a choice of colours. Pictures are mounted on matching tissue leaves with overlays. A preview website usually within a few days so your friends and relatives can see the pictures as soon as possible. The price for this is currently £1400. This is the big one - it can cost as much or little as you wish. You decide what you want, talk to us, we will figure out a price, get back to you and talk it through. This can include pre-wedding shoot, pictures, albums (digital and traditional), coffee table books, thank you cards, parents albums, trash the dress shoot, gifts for parents and much more. The sky really is the limit! The price for this is totally dependent on what you require and subject to a formal quotation.